Click here to go to the original Facebook post. “More than 3 million children under the age of 5 in Nepal are at risk of death or disease during the harsh winter months due to a severe shortage of fuel, food, medicines and vaccines[,]” warned the UNICEF press release earlier this week. In other words, to the earthquake victims, the coldness of this winter will be worse than the coldness of our leaders in Kathmandu towards them the last seven months. So, when I learned for instance that Navaraj Basnet maintained his excellent academic record, or when I learned that he and Savita Gole received the Star Reader award for the most library books read by a male and female student respectively at Raithane School, my heart had warmed. And when these once extremely shy children, little by little, started warming up to me by coming to greet me with a smile when they saw me, and when that progressed to them sharing their personal stories and situations, I had begun to believe that I was making inroads…albeit small. When for instance Parvati Gole shared why she had lost so much weight since the last time I had seen her; or when Samjhana Tamang told me, with a smile, her mother, after all, wasn’t sending her off to Delhi to work (as had happened to Muskaan); or when Sanju Pariyar mustered the courage to share with me why her attendance had been so poor; or when Savita reluctantly shared her story of having to go into the forest to collect wood, early in the mornings, before school, to “pay” for her groceries…and when we had been able to find solutions to some of those issues (Sanju’s attendance, Savita’s need for more funds etc.) — I had entertained glimmers of hope…glimmers…. And then the earthquake struck. Fourteen students in Thangpalkot died. All thirteen of the sponsored students survived but none of their houses did! Some of their families lost livestock and two lost family members — Samir Pariyar lost his grandfather and Sanju lost her father, the two becoming part of the statistics of about 9,000 that succumbed to the calamity. All schools in Thangpalkot were also heavily damaged, just like the 16,000 others — almost half of all schools in the country. Several hundred Thangpalkot students became part of the statistics of about the million or so around the country left without schools to go to. But, as part of my sponsorship-program routine work, sometime in September, I published the details of the educational expenses for this academic year at both Raithane School and Taltuleshwori School. However, considering their loses and their needs, sending out sponsorship-fund requests to our sponsors felt a little strange and surreal. So I never did. In the mean time, COMMITTED has been housing Thangpalkot students in Temporary Learning Centers and conducting some educational activities. The (willful criminal?) neglect of the earthquake victims, including the needs of children, by the political leaders, has been pretty much total. Initially fighting over who the CEO of the National Reconstruction Authority (NRA) should be, later wrangling over who else to include in the authority etc., all the while embezzling funds, mismanaging the relief materials and creating and placing obstacles and hurdles to relief and reconstruction work instead of facilitating them. Thanks to them, the NRA, the one hope for the victims, is already a defunct body. Consequently, the victims found no respite, even having to fend for themselves throughout the monsoon season! There is little account of how those that did survive the annual torrential rains, floods and landslides exacerated by the earthquake actually managed it. And how many succumbed? The earthquake and the monsoon however were only the beginning of their woes! Protests and strikes by those in the Southern Plains in August against the new constitution followed. The ongoing protests and strikes has at times turned violent and has claimed almost fifty lives to date. The subsequent unfair and illegal economic blockade by India has crippled the rest of the country, compounding the humanitarian crisis faced by the earthquake victims. The entire country is suffering from severe shortage of fuels (petrol, diesel), cooking fuel (kerosene, LPG gas), food and other essential items, such as medical supplies. Businesses, factories and schools have shuttered, inflation has gone up and black markets have boomed etc. Now, winter, unforgiving hill and mountain winter, promises to add to the suffering…still…. I have visited and traveled in the hills, from the Annapurna area in the Central West to Jiri in the East and the areas in between, such as Gorkha, Langang and Sindupalchok, areas affected by the earthquake to know what winter is like in those areas. Visiting Thangpalkot, COMMITTED’s project site in the winter, my synthetic thermal underwear, synthetic mid-layers and outer jackets, insulated winter shoes, woolen socks and gloves helped fend off most of the cold. Sometimes though even they weren’t adequate. Hardly anyone from Thangpalkot has any of that, of course! Forget indoor heating! Even my last visit in early March was cold enough that I needed winter clothes and sleeping bag! Snuggled inside my sleeping bag, in a bedroom inside an intact concrete building, I felt the shivers! Only six of the 600 houses in Thangpalkot stand! I very much doubt the shelters those children have will provide much protection against the bitter Thangpalkot cold. Another reason I can relate to the situation those hill children find themselves in this winter is my own childhood experience. I just have to go back to how it was during my childhood in Nepal when my family was nowhere near as well off as we are today. 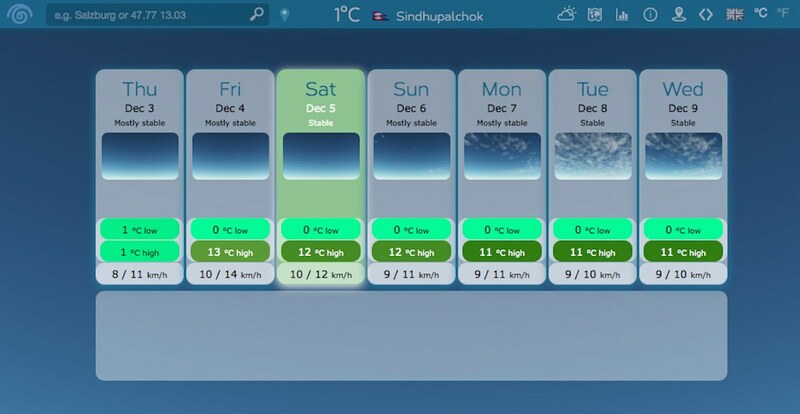 Sindhupalchok weather forecast for the next seven days. Minimum temperature is at or near freezing. Temperatures dip further the rest of December and most of January. What’s more, winter cold has killed every single year for the last three years, including in the southern plains. Lacking in proper shelter to protect them from the elements, lacking in adequate food to keep them healthy, lacking in clean water and adequate medical supplies etc. — this winter will claim more children, I am certain! The very poor will be the first to go…which, in the earthquake affected area, includes most of them! Apart from the three millions below 5 that the UNICEF press release mentioned, how many others will suffer? We will probably never know the exact numbers. Those thirteen sponsored children, and others like them — the million or 2.5 million, depending on the sources, affected by the earthquake in the hills and the 1.5 million by the protests and blockade elsewhere — what of their future? If the neglect of the people by our political leaders and democratic governments of the country for the entire twenty-five year history of our democracy; if, more specifically, their neglect of the earthquake victims for the last seven months; if the lack of commitment displayed by our political leaders and our government to resolve the issues with the Madhesis the last three months; if the lack of urgency our political leaders and our government has shown to resolve the issues with the Indian Government to have the embargo lifted etc. are any signs of things to come…there may be no future for those Nepalese children. I have appraised all of this from a distance, while traveling in the US having arrived here on March 31, before the earthquake. Had I been in Nepal I wonder if I would have been able to make much of a difference. On the other side of the globe now, I am at a loss for what I could do to really make an impact. In the long-term, we need an overhaul of the political, social and economic systems in the country. What’s the short-term solution? File a case with the International Court of Justice (ICJ) in the Netherlands against the Government of Nepal charging them with wilful criminal neglect or crime against humanity? 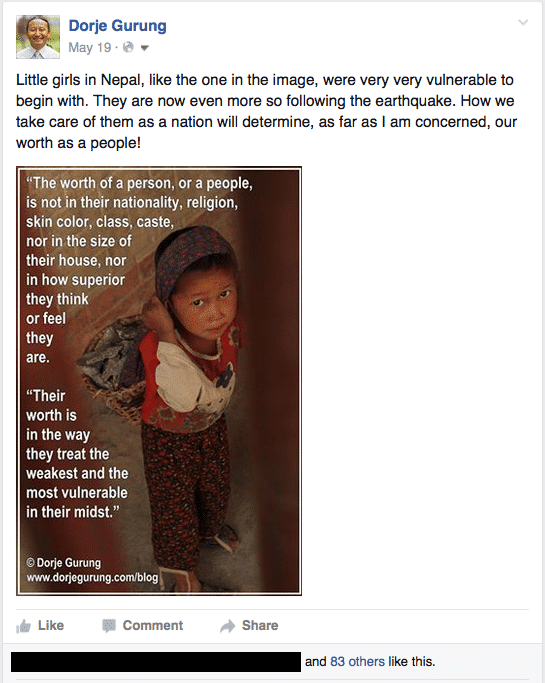 I am forced to go back to my May 19 Facebook post (see image the top) and left to ponder and ask: what then is our worth as Nepalese people? April 29, 2015. Nepal earthquake: ‘5000 schools destroyed and thousands more damaged. November 28, 2015. 2k factories fall silent in industrial heartland. November 29, 2015. Billions of rupees embezzled in post-quake relief drive, concludes CIAA. December 3, 2015. No Man’s Land. That our state cares for no one, Madhesis and Pahadis alike, lies in its response to the April Earthquake. October 8, 2015. Nepal faces looming food crisis after natural disasters hit farmers. Ocober 2015. Fuel shortage cuts food supplies in Nepal. December 12, 2012. Cold and poverty kill 17 people in Nepal. January 9, 2013. 49 dead in Nepal cold wave. December 30, 2014. 7 dead due to cold wave in Mahottari. May 13, 2015. Nepal School System Left Shattered in Aftermath of Quake. April 28, 2015. Unicef: Nepal Quake Affected 2.8 Million Children. November 18, 2015. Nepal border blockade ‘threatens the future of the country itself’, says UN. My mate Pete Pattisson’s article which states, according the UN, that an estimated 1.5 millions students in the Southern Plains are out of school. October 24, 1015. Nepal earthquake: Six months on from the country’s double cataclysm, the survivors tell their stories. September 3, 2015. Reconstruction in Limbo. September 2, 2015. Four months after quakes, Nepal fails to spend any of $4.1 billion donor money. ← Is Media in Kathmandu as One-sided as They Appear?…And What of the Nepalese People?